"Therefore if any man be in Christ, he is a new creature: old things are passed away; behold, all things are become new." II Corinthians 5:17 Our meeting with Christ always makes the difference. We will know it, and so will others. "Let your light so shine before men, that they may see your good works, and glorify your Father which is in heaven." "There is therefore now no condemnation to them which are in Christ Jesus, who walk not after the flesh, but after the Spirit." Romans 8:1 Regeneration in Christ brings release. Refuse to live in the past. "If any man be in Christ, he is a new creature: old things are passed away; behold, all things are become new." "Jesus answered and said unto him, Verily, verily, I say unto thee, Except a man be born again, he cannot see the kingdom of God." St. John 3:3 The new birth is a lot more than a decision to do a little better. It is a departure of the old nature, giving way to new life in Christ. It becomes "Christ in you the hope of glory." Father, help us all to see how easy it is to receive Jesus, and yet how easy it is to pass Him by and lose eternal life forever. "...Put off all these: anger, wrath, malice, blasphemy, filthy communication out of your mouth. Lie not one to another..." Colossians 3:8,9 Here are some things that we can do without in this life. When we put on the new man through Christ, then we can put off the old man with all his evil deeds. "A new heart also will I give you, and a new spirit will I put within you." Ezekiel 36:26 You can't whitewash the old heart and expect a new spirit. Allow God to make the exchange of a lifetime and give you a new heart and a new spirit for a new year. "Old things will pass away, and all things will become new." "...Behold, I make all things new..." Revelation 21:5 God has the power and is willing to give us a new start. If you are tired of the old life, then accept the new one that He has for you. "If any man be in Christ, he is a new creature: old things are passed away; behold, all things are become new." "Jesus answered and said unto him, Verily, verily, I say unto thee, except a man be born again, he cannot see the kingdom of God." St. John 3:3 Never have there been so many churches with the evidence of so few real Christians. It is highly possible for one to be known by everyone in church and yet be a stranger to Christ. "But the voice answered me again from heaven, What God hath cleansed, that call not thou common." Acts 11:9 Whatever and whoever God touches is never the same. Regeneration elevates. "If any man be in Christ, he is a new creature: old things are passed away, behold, all things are become new." "Jesus answered and said unto him, Verily, verily, I say unto thee, except a man be born again, he cannot see the kingdom of God." St. John 3:3 What the world needs is not only born leaders, but born-again leaders. You can be born again. "Ye must be born again." "Jesus answered and said unto him, Verily, verily, I say unto thee, except a man be born again, he cannot see the kingdom of God." St. John 3:3 What good would it do to refine man if he is not regenerated? The heart of man, as well as the head of man, must be reached. Culture may polish up a man, but only Christ can really cleanse him. "Come now, and let us reason together, saith the Lord: though your sins be as scarlet, they shall be as white as snow; though they be red like crimson, they shall be as wool." Isaiah 1:18 If an artist is able to take a piece of junk and make it into a thing of beauty, think of what the Lord can do with our lives turned over to Him. Let the Lord Redeemer recycle your life today. You will be glad with the results. "Jesus answered and said unto him, Verily, verily, I say unto thee, except a man be born again, he cannot see the kingdom of God." St. John 3:3 Do you know the process? Simply pray, Father, I receive Jesus as my Saviour on the basis that He died for my sins, and that I cannot be saved without Him. I repent of my sins, and I release it all to You. In Jesus' name. Amen. Thank You. 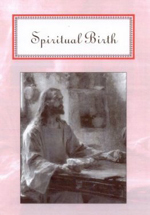 "That which is born of the flesh is flesh; and that which is born of the Spirit is spirit." St. John 3:6 Here is the heart of God in the interest of the souls of men. The next move is yours. Jesus said, "Come unto me...him that cometh to me I will in no wise cast out." "Jesus answered and said unto him, Verily, verily, I say unto thee, Except a man be born again, he cannot see the kingdom of God." St. John 3:3 This is more than a term. It is an experience, without which, we are not ready to meet God. It means being born from above, and it can happen right now by praying a prayer like this. Father, I repent of my sins, and I receive the Lord Jesus, Your Son, into my heart as my personal Saviour and Lord of my life. Amen. "Enter ye in at the strait gate: for wide is the gate, and broad is the way, that leadeth to destruction, and many there be which go in thereat: Because strait is the gate, and narrow is the way, which leadeth unto life, and few there be that find it." St. Matthew 7:13,14 Heaven is no walk-in or pushover. "Except a man be born again, he cannot see the kingdom of God." "Now unto him that is able to keep you from falling, and to present you faultless before the presence of his glory with exceeding joy." Jude 24 Don't worry about the carry-over of the old life once you have surrendered it to Him. "If any man be in Christ, he is a new creature." "Behold, I make all things new." "For the Lord himself shall descend from heaven with a shout, with the voice of the archangel, and with the trump of God: and the dead in Christ shall rise first: Then we which are alive and remain shall be caught up together with them in the clouds to meet the Lord in the air: and so shall we ever be with the Lord." I Thessalonians 4:16,17 What a beautiful picture of the future! But remember, there is no reunion without regeneration! "Except a man be born again, he cannot see the kingdom of God." You can take care of that in the next moment by turning from your sins and inviting Jesus into your heart.